Have you ever watch Little Mermaid cartoon? or Movie? it's a story about a mermaid that fell in love with a human being rite? Most of us knew the story and even made a story as a favourite bedtime story. This one another different story. It's an old video actually but some "irresponsible" people re-edit the title and spread it like a storm throughout Sabah via MMS or Bluetooth devices. I heard some of it being share via email and facebook but no proof yet. Many friends especially from Luyang believe it as a real mermaid. Something kept playing in my thought, "in this era of there's still people who believe in superstitious?? Maybe their educations background??" KOTA KINABALU: A “dead mermaid” has reportedly been found on the beach of an island off Sabah’s northern Kudat district, causing a lot of excitement in the state. A clip has also surfaced on YouTube of the “mermaid” lying dead on the shores of the island. The clip has been on YouTube under the heading “Dead Mermaid in Kudat” since Oct 3, but tales of the mysterious find had begun much earlier. Police, have, however brushed off any talk of a dead mermaid. “It is a hoax, someone is playing the fool,” said Kudat police chief Deputy Supt Dawi Ossen yesterday. He said they too had got wind of such talk spreading around Kudat town earlier this week, and had checked with the villagers of Pulau Balambangan where the “mermaid” was found. “There was no such thing; neither had any body been washed ashore,” he said, explaining that the video clip did not show the island’s surroundings as claimed. DSP Dawi added that a resort operator there had told police nothing unusual had been found on the island in recent weeks. “I hope people don’t get taken in by the video clip, it is totally baseless. Most likely, it’s someone playing a trick,” he added. Initially when the rumours spread, police assumed that a human body had been found on the island. They were prompted to check the rumours because of concern that people might not have reported finding a dead person. 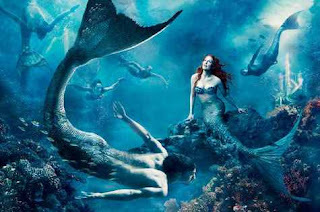 Mermaids are suppose to be a legend but that doesn't look like one. @_@"""